Blog / Weekly report 08/24. 3. Deployment of Crowdsale (with token) to “mycrowdsale1” account. 5. Transfer crowdsale rights to the user. All these steps will be fully automated. Crowdsale development status: 67% completed. 1. Now we are looking for partnerships with audit companies, In order to provide security certificates for every created contract. 2. As we are the first platform to allow the creation of token contracts on EOS blockchain, Here is an article written by Vladimir Tikhomirov about why you should create your token contract on EOS, and also how to use our platform to create it. 3. 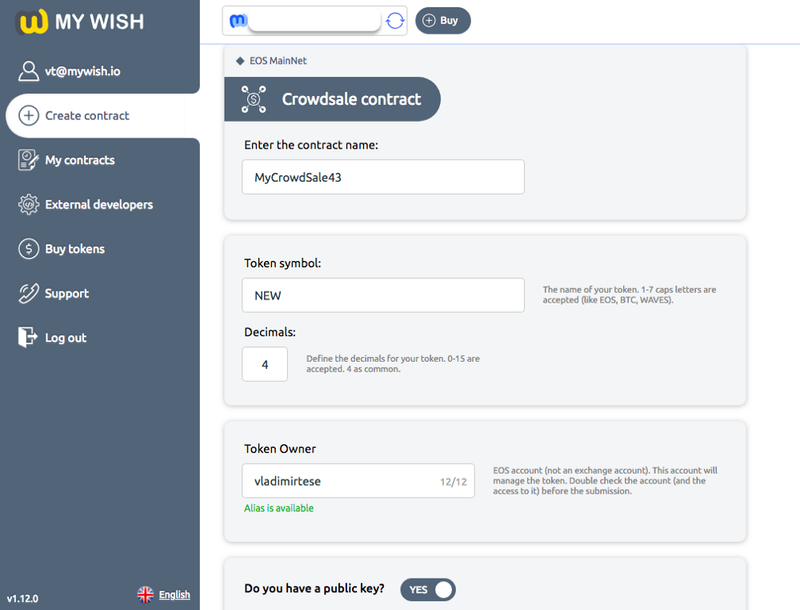 For better service, now the fees to create an EOS account on MyWish are 0.1 ETH. Investment Pool & Airdrop contracts are 0.5 ETH now. 4. We finished recording the tutorial about how to create your EOS account on MyWish platform, the tutorial will be on our Youtube channel on Saturday. 5. Now we are recording the tutorial about how to create a Token smart contract on EOS using our platform, It will be available on our channel during the next week. 6. For our EOS marketing campaign, we are contacting bloggers who are interested in EOS in order to promote our service. We are continuing planning for something great you will know everything about it in September, so stay tuned.